Actors! Looking for Summer employment? Want to work at your craft AND get paid?! 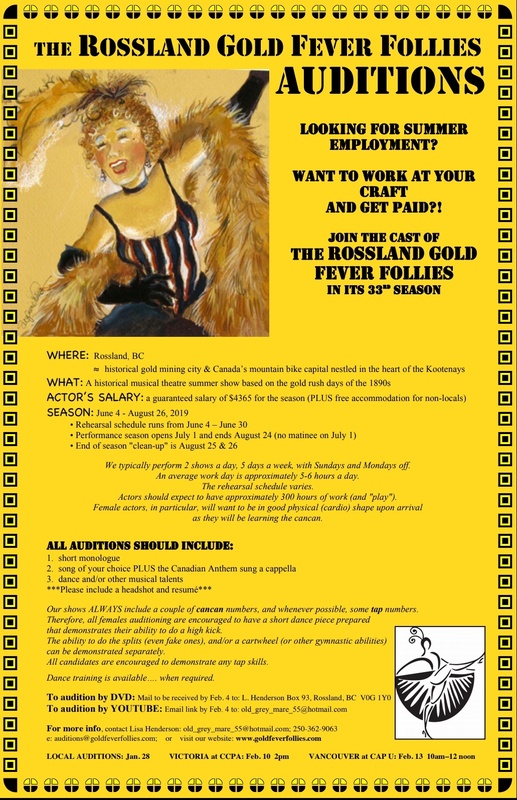 A historical musical theatre summer show based on the gold rush days of the 1890’s. We typically perform 2 shows a day, 5 days a week with Sunday and Monday off. An average work day is approximately 5-6 hours. The rehearsal schedule varies. Actors should expect to have approximately 300 hours of work (and “play”). Female actors in particular will want to be in good physical shape (cardio) as they will be learning the cancan. Our shows ALWAYS include a couple of cancan numbers, and whenever possible, some tap numbers. Therefore, all females auditioning are encouraged to have a short dance piece prepared that demonstrates their ability to do a high kick. The ability to do the splits (even fake ones), and/or a cartwheel (or other gymnastic abilities) can be demonstrated separately. All candidates are encouraged to demonstrate any tap skills. Dance training is available, when required.